This is the Evolution of Oreki Houtarou. 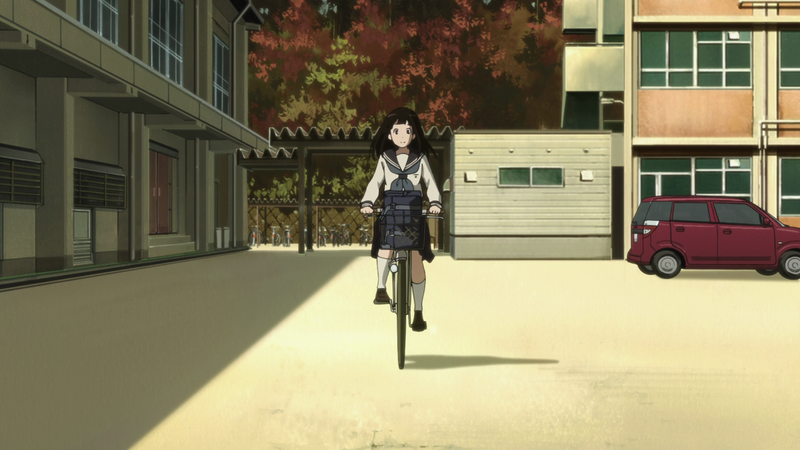 All of Hyouka‘s episodes are purposeful and relevant to the overall character journeys the series helps us to follow, but this episode in particular falls into the category of being one of those episodes that defines an entire show. The header image for this post really says it all—Oreki, with Chitanda at his back, has become someone who can care about other people. He has become, I feel, more human, by virtue of his increasing capacity to understand others, than he has ever been before—not just a deductive machine, but a person of empathy. He’s learning, one might say, to use his powers for good. That is the story of this episode. 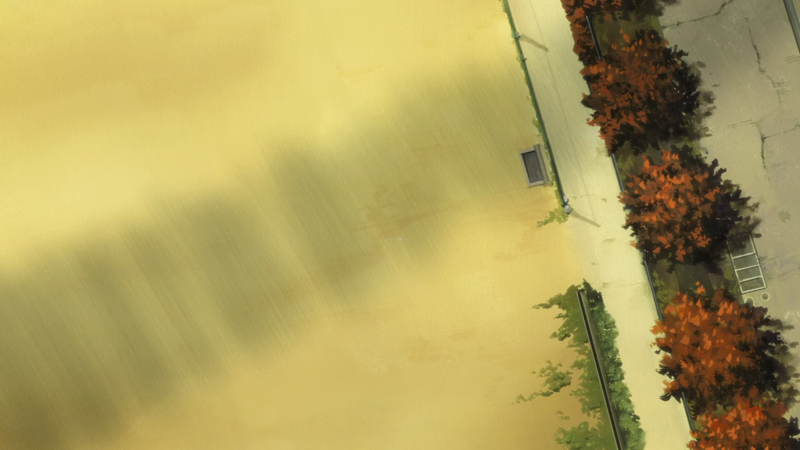 From start to finish, we see one climax on Oreki’s path as he remembers, considers, and, ultimately, understands. It’s a day in the life of Houtarou Oreki that starts in a way we’ve seen before. 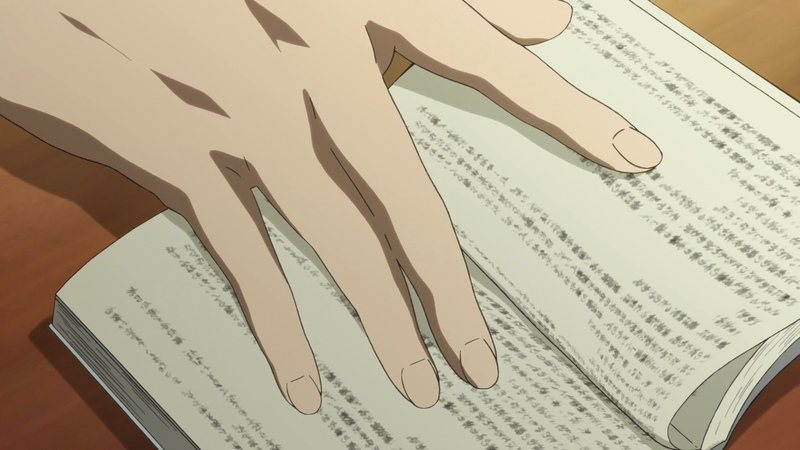 He’s reading a book, and the sequence of cuts imitating a zoom out during Chitanda and Mayaka’s conversation about plants and what makes them grow (an apt metaphor for the effect Chitanda’s presence has had on Oreki, you might say—she’s his lightning) alerts us once again to his typical detachment from the goings on of the Classics Club. But today, something is different. 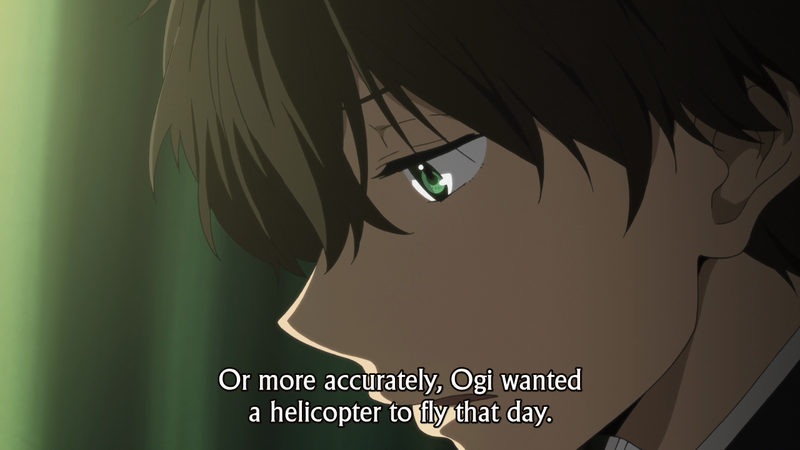 Today, Oreki looks up, and as the camera rotates, foreshadowing the spinning of the helicopter blades outside, he remembers something… and, in a movement we’ve not really seen from him before, he steps out of himself and towards someone else. You might say that he’s reaching towards the freedom of understanding others. There’s a world beyond the window. Despite the fact that this is something that intrinsically deals with and is based in Oreki’s character, it would be foolish to think that he has come to this point on his own—or, even, simply with Chitanda’s help. 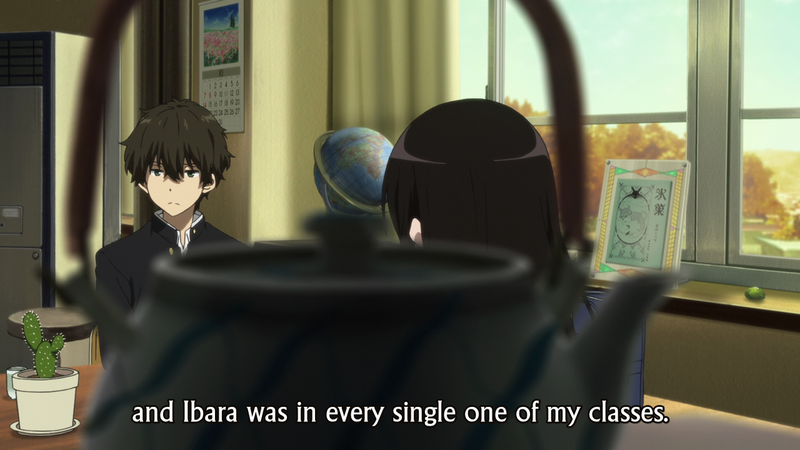 Yes, Chitanda has obviously been the main impetus (as seen by the way they are framed together within the arc of the teapot handle) for the development of an Oreki who is willing to look beyond himself in this way, but Satoshi and Mayaka have been there all along, too. It’s amusing to watch Oreki protest that this change has happened—both now, and later in the episode—as if he can deny its reality. Satoshi and Mayaka’s overblown reactions—complete with dramatic canted angles, close-ups, and silly character acting in contrast to Oreki’s calmer cinematography—are funny, but this is where we go when faced with something new. To be genuine about this moment is beyond them, so they fall back into sarcasm and teasing. It’s not wrong. It is what it is. But there’s someone else in the room besides the two of them. Someone who’s always engaging with Oreki on a genuine level. 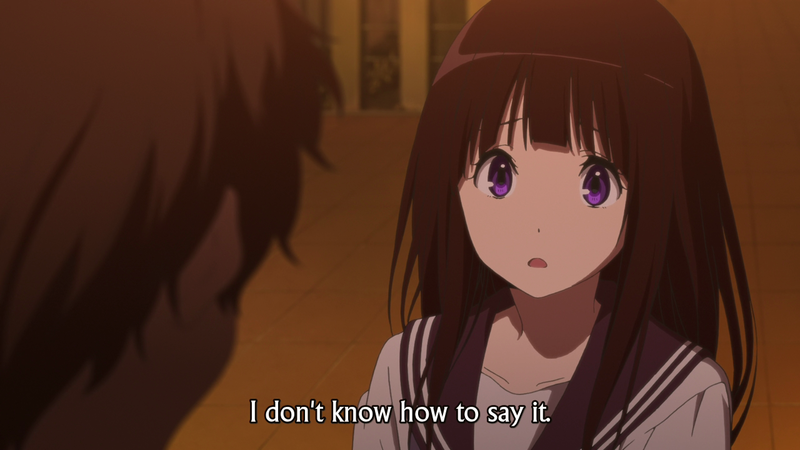 Chitanda can’t help it. And so, in a 15 shot sequence, we see her serious curiosity overwhelm Oreki—and it all makes sense. From the start of the show, we’ve seen the unstoppable force that is Chitanda’s curiosity turned towards mysteries of circumstance and mysteries of the past with equal power. But these are mysteries external, and though she’s clearly been as fascinated by Oreki’s prowess, for the first time he has given her a clue into the enigma that is him. The hint that trips off her curiosity, as we have seen time and time again. 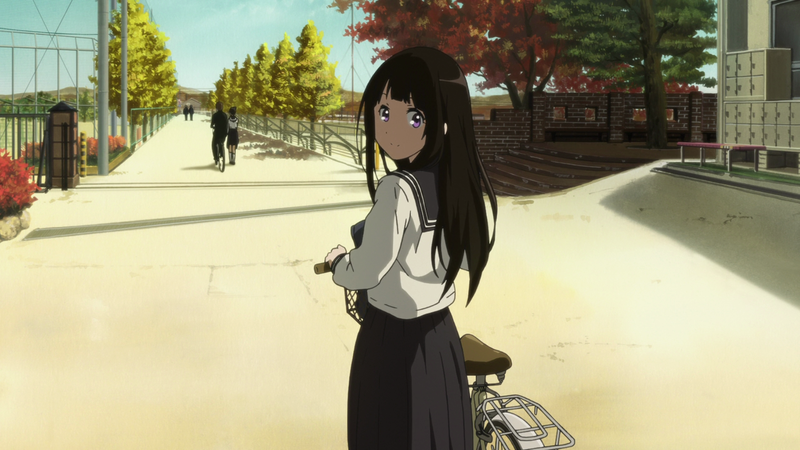 And it’s all done in classic Hyouka cinematographic style, with the visual beats that have become all but inseparable from these two characters’ relationship—with just enough new visual ideas to make it both fresh and expressive of the slowly shifting dynamics of their interactions and friendship. 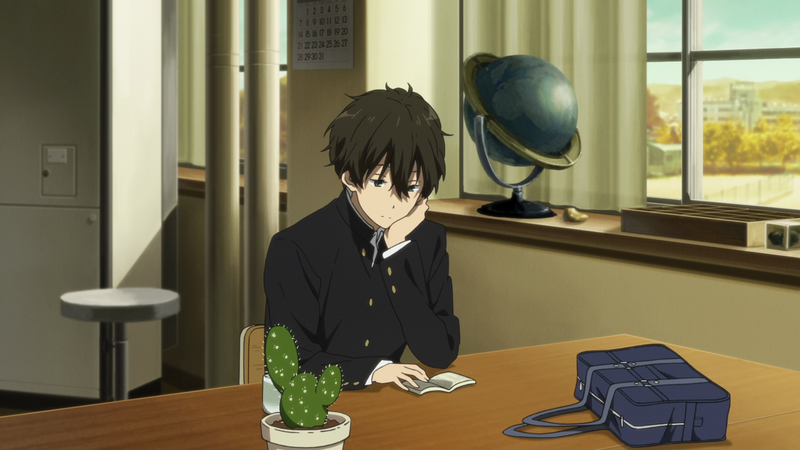 And so, it should come as no surprise that it is Chitanda (and Chitanda alone) who accompanies Oreki to the library for his research on Ogi-sensei. Although Satoshi and Mayaka are Oreki’s friends, definitely, neither of them have invested in him the way Chitanda has. 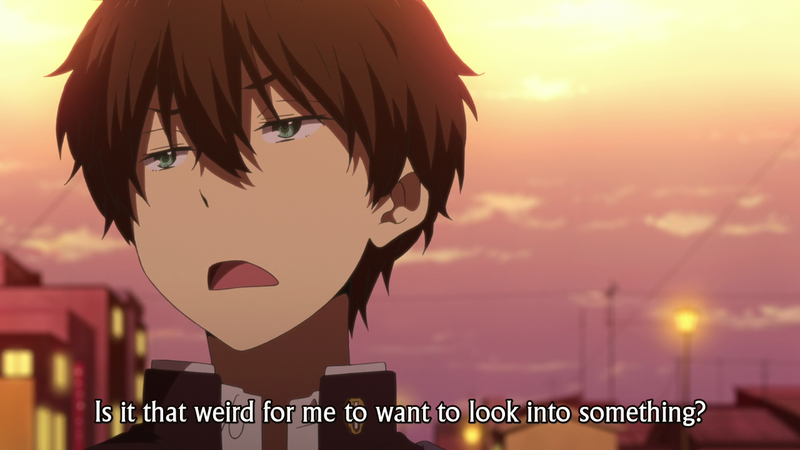 And, anyways, Oreki is already rationalizing ways for him to be alone with Chitanda. His romantic inclinations towards her have been obvious for a while now (although perhaps they’re not so defined as to call them romantic—infatuation or fascination might be better words to choose), and the embarrassment and teenage awkwardness of that not-quite-there feeling compels him to avoid the situation that would place him and Chitanda together in a setting more than that of partners (or one put-upon and on putting-upon, as he might say). And there’s a denial there. 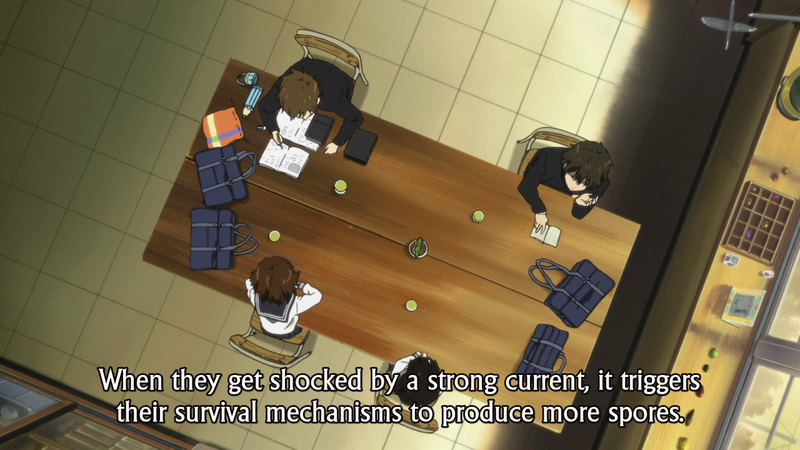 Again, although Oreki is changing before our very eyes, these are not changes that he wants to acknowledge. And so, he lets Chitanda go as she arrived—alone. They reunite in the library—coded green and yellow, the colors established from episode one as indicative of Oreki’s own awakened curiosity. 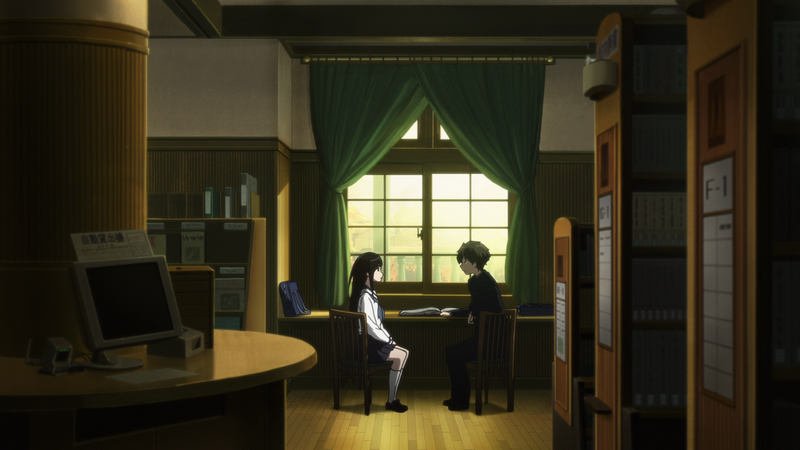 These tones appear throughout Oreki and Chitanda’s quest for the newspaper, finally coming together in the place where the mystery will be solved, where the answer to Oreki’s curiosity will be revealed (and the engagement with other people that this indicates becomes complete). 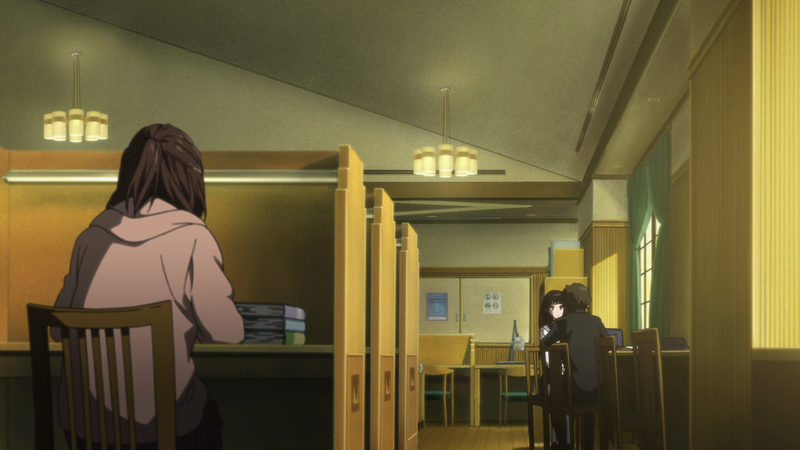 As Oreki walks Chitanda through his deductions about Ogi-sensei, the camera takes on the task of revealing the closeness of their relationship within the context of the wider world (and important point considering that it has been Chitanda’s influence that has enabled Oreki to come to this point). Early on in the conversation, they are framed multiple times within the window—an intimate and delicate choice that makes it seem as if they are alone together in the world, isolated from everyone else. But they are not, as the cinematography suddenly breaks out from the close-ups and shots framed in frames, showing them from a new angle and demonstrating the nearness of others to them. It’s a thrilling moment, because this is indeed the point. The coexistence of exclusivity and understanding, of the gaps and bridges between human beings. Because although Oreki may deliver each point leading up to the conclusion in close-ups, when he finally reaches the goal, when he finally reaches a place of understanding, he does so and the shot shows the library extending far behind him. Understanding others, or at least making the effort, opens up your world. Of course, Chitanda can’t help but wonder, as she always does once she understands the facts, at what Ogi-sensei might have been feeling. 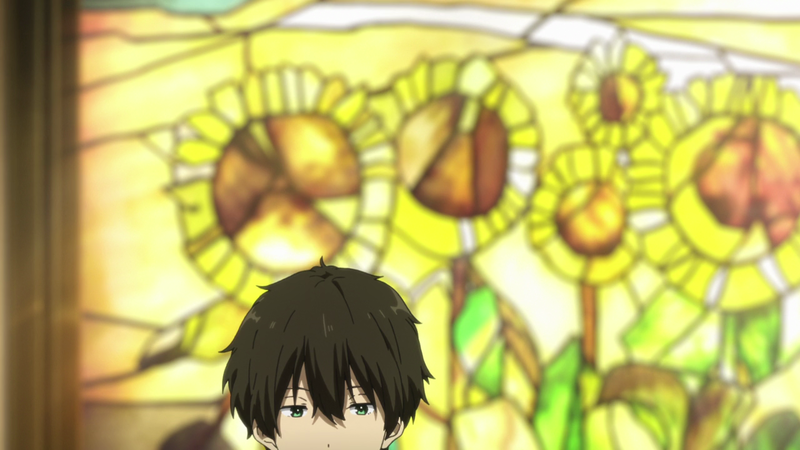 Oreki has come to the logical deduction of the rationality, but he has not yet explained the human element. Will he? His answer is that he cannot know, cannot understand. But perhaps he understands enough. 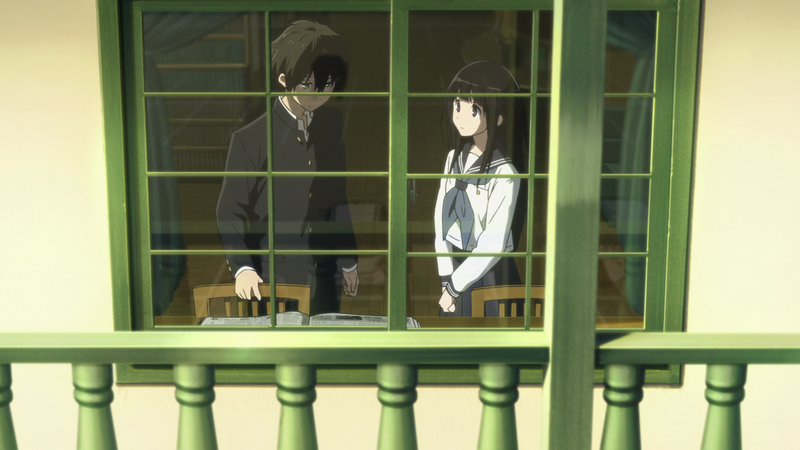 Both Oreki and the Ogi-sensei of his memory are framed against the backdrop of an open window. The statement of fact—”I think he was smiling”—the language Oreki knows best, has become the symbol for the unspoken truth that yes, he has gone deeper and he has reached out beyond himself. 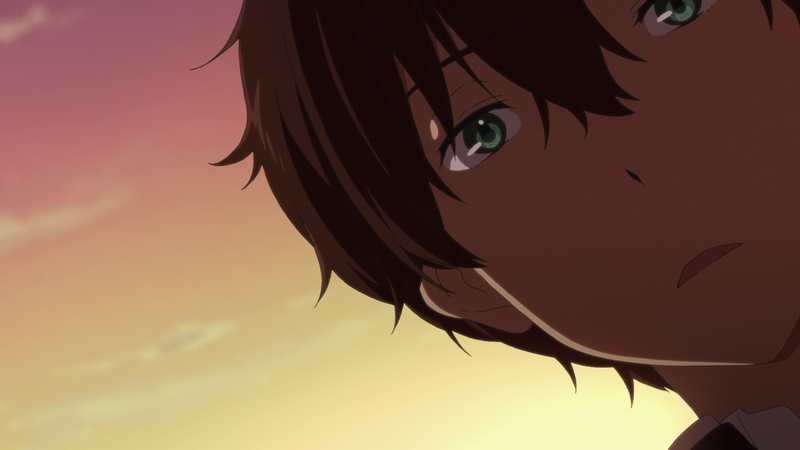 This one scene its own would be enough to end the episode, but in a sort of insistent clarity that Hyouka rarely affords the audience, we see an even more explicit expression of this evolution of Oreki Houtarou. 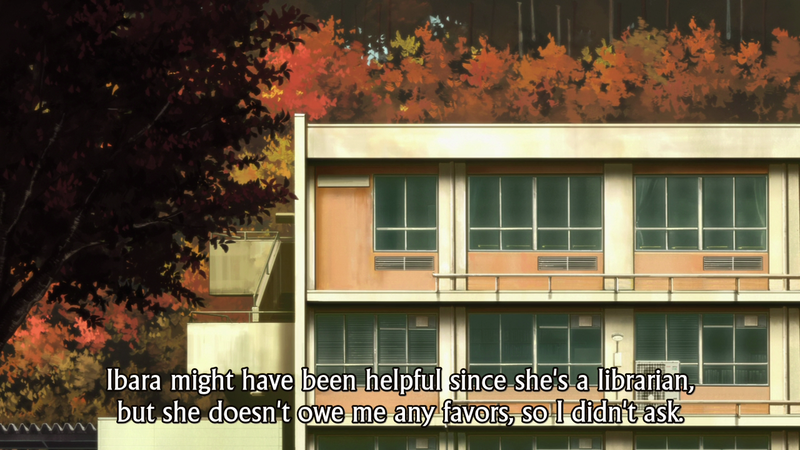 For once, Chitanda has really just been a witness to Oreki’s activities. Not the driving force, but the vessel towed in his wake. It is, rightfully, a day that draws from her the least exuberant, most grounded expression of her curiosity—one might even call it wonderment. And Oreki knows the difference instinctively. This is not an imposition, it is a request. 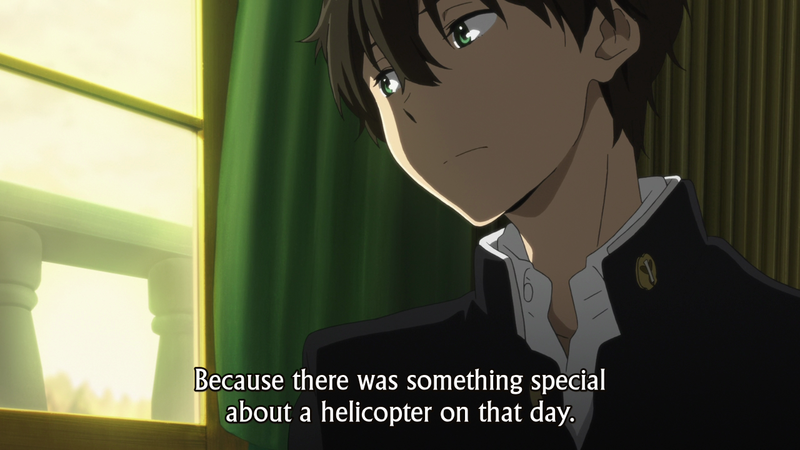 And Oreki’s answer… well, for me, it was just a beautiful, just as baffling, and just as awesome as it is for Chitanda. 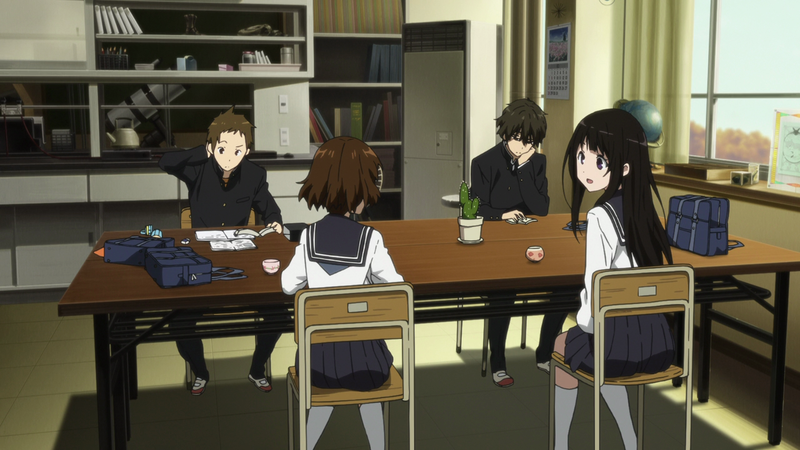 For just a moment, Chitanda becomes the lens through which we see Oreki. It is an ironic sort of cinematic reversal, because while the camera response to Oreki’s answer focuses on Chitanda’s reaction to that answer, it is as if we see Oreki clearly, brilliantly for the first time. His humanity laid bare by seeking to understand another human person, we in parallel see this humanity through Chitanda’s own expression of human emotion and awe. It is a truly beautiful thing to witness. Here again, we have an ending. But the story goes on. The effects of the transformation continue. Words fail Chitanda, as is only right for having witnessed such a wondrous thing as a person like Oreki evolving beyond what he has been before. She leaves. But this time, the new Oreki, rationalizing though he may be, doesn’t let her go ahead alone this time. This human connection, this understanding. It is real. 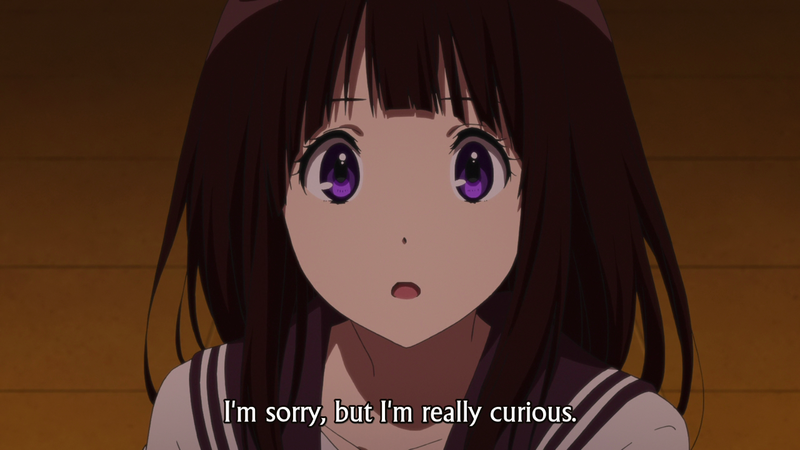 You know, your Hyouka posts really are very, very good. I have little to add, but I thought I’d drop in to let know I’m reading with as much interest as I ever. I kind of overlooked this episode a bit the first time I watched it, sandwiched as it was between the brilliant storytelling of ep 17 and all the Oreki/Chitanda goodness of ep 19. Coming back to it afterwards, though, made me realize that it’s every bit the equal of those other two episodes, just in a different way. As you said, this is proof that Oreki has changed since joining the Classics club, and significantly for the better. 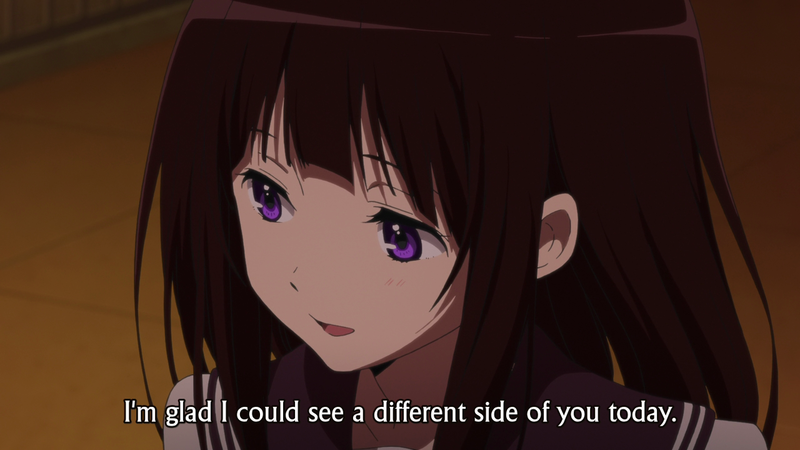 Chitanda certainly recognizes that too. He’s been crushing on her for a while, of course, but being the good OreChi shipper that I am, I like to believe their conversation after they leave the library, and seeing him show that kind of empathy towards someone who for all intents and purposes is a stranger to them, is the moment when she really starts to fall hard for him, too. I also found this episode interesting for the glimpse inside of a Japanese public library, being a professional librarian myself. It was pretty similar to what I’m used to in my own workspace, but it did make me kind of curious about the state of their electronic database resources, since the librarian had to go old-school and retrieve a bound physical copy of the newspaper they wanted. My library system has its newspaper articles from all of the local papers either stored electronically (as transcribed articles or full-page scans of the original) or on microfilm – it’s been ages since we kept actual back issues in stock that would’ve been 3 or more years old like that. Maybe the Japanese prefer physical copies because kanji doesn’t go well with OCR technology or something? Anyway, it’s no biggie…just professional curiosity. Heh, I said on twitter when I was watching the episode that yes, this kind of empathy is an attractive trait for anyone to have. And for Chitanda, in particular, who is already always worried about how people are feeling, it’s a moment where Oreki aligns himself with that particular concern of hers on his own volition. It makes sense that she would feel something in response to that kind of showing from a boy who’s been somewhat mechanical throughout the series. And that’s an interesting question about the library! I haven’t done research at a public library in forever, so I don’t really know how much has been digitized in the modern library world. Another thing I’d mention here is to consider the setting. 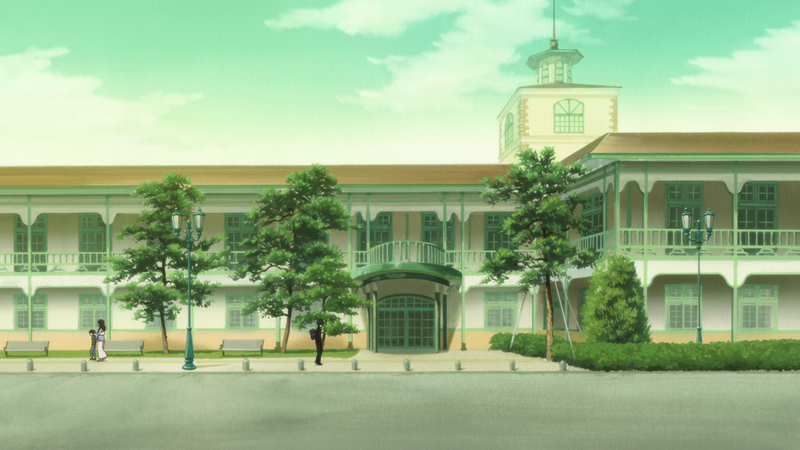 Hyouka was made almost five years ago now, which means the novels were written even early—and, furthermore, this is a small, traditional, country town. So I doubt it would be reflective of the top tier of Japanese public libraries…just more things to wonder about!